How can a waterfall be a reminder of how God’s love can envelop us? Fiona shares. “He draws up the drops of water, which distill as rain to the streams; the clouds pour down their moisture and abundant showers fall on mankind” (Job 36:27-28). 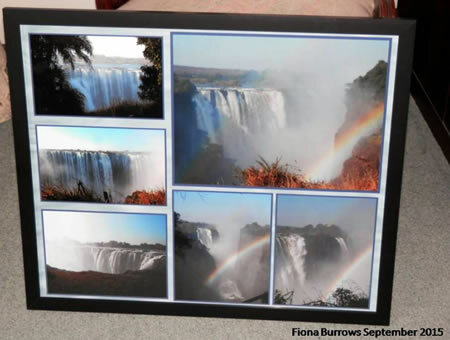 I shared with some friends a picture of the poster print I’d had made of some of my favorite recent waterfall shots and mentioned that I planned to hang the poster above my bed. Some things came to mind as I thought about her comment. A waterfall runs continually. Water flow may diminish or increase, but if the water source is permanent, the waterfall will be too. God pours out His love for us continually. He never stops loving us and nothing could make Him love us more, or less, than He does. His love is abundant. It never runs out and it’s always enough for everybody. Being near flowing water has always refreshed me. In the morning His mercies are new (Lamentations 3:23), refreshing me overnight. The joy I find in waterfalls reminds me that the joy of the Lord is my strength (Nehemiah 8:10). He gives me joy and the strength I need to face whatever today and each day may bring me. It’s impossible to see all of this particular waterfall in one photo, but God sees and knows all. Waterfalls have taught me many things before, but I’m thankful for this new enlightening from God, by way of a dear friend. God enables us to prompt others and cooperate together in so many different ways! Many days I don’t want to get out of bed in the morning. So what does God want me to remember as I see this picture, one of the first things I see each day? Maybe it’s that His abundant love also flows through me–each new day. So what will I do with His love today? 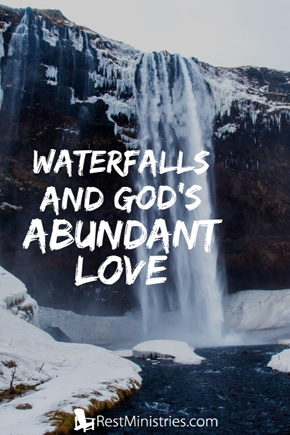 Prayer: Father God, I’m so thankful for waterfalls and that “hope does not disappoint us, because [You have] poured out [Your] love into our hearts by the Holy Spirit” (Romans 5:5). May that love refresh and uplift each one reading this today, and as we are refreshed, may we refresh others too. Amen. What could God be teaching you from a waterfall today? Thanks Venus – glad you were encouraged. Love, love, love this. One of my favorite things to paint is a waterfall. This has given me much, today, Fiona. I’m considering it my birthday present from you and God! Saving this one and love the photo! Your mat-carrying friend who is so grateful for you! Oh deni, so glad this brought encouragement today – especially if it’s your birthday! Waterfalls would be one of my favourite things to photograph, so I can understand why you’d love to paint them. I’m still blown away by how beautiful this one was and seeing these photos every day is such a reminder of God’s creative, powerful and wonderful blessings for us. I love this message, Fiona. Thank you so much for sharing this insight with us. It gives me comfort and hope. May God’s waterfalls of abundant love wash over us! Trudy, it was a joy to be able to share this! Fiona you blessed me so much today! Thank you for this wonderful devotional! I always love waterfalls! In fact the Bible College I attended had a big waterfall right on the campus. To me they show the awesome power of God in the rushing water, but on the flip side there is the beauty of God as well. Thank you dear friend for sharing! I love the idea of “power and beauty” – they do so remind us of all of God’s blessings to us. Fiona, such a sweet blessing in this devotional. I can almost feel the cool Mist of the falls. Perhaps if we close our eyes we can enjoy that same refreshing mist as the Holy Spirit showers us. Thanks Kerryn, for your comment that led to this – and your continuing encouragement!